New Belgium Brewing has had success in a bunch of different beer styles, most notably with their popular Voodoo Ranger IPA line and the fan favorite Fat Tire. But they’ve never distributed either of those beers as widely as their newest offering. 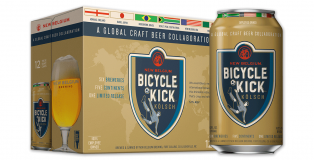 Enter Bicycle Kick Kölsch, their new, refreshing brew primed to be the premiere beer of this June’s World Cup. To give it added appeal for “The World’s Game,” New Belgium decided to partner with five breweries on five different continents, creating a truly unique collaborative beer that boasts the finishing touches from five distinct breweries. The kicker, pun intended, is that each brewery that brews Bicycle Kick will also distribute the limited time beer across their distribution footprint. That’s five continents, making it New Belgium’s most widely distributed beer ever. We asked New Belgium spokesperson Jesse Claeys about how the Fort Collins brewery brewed a beer with worldwide appeal.